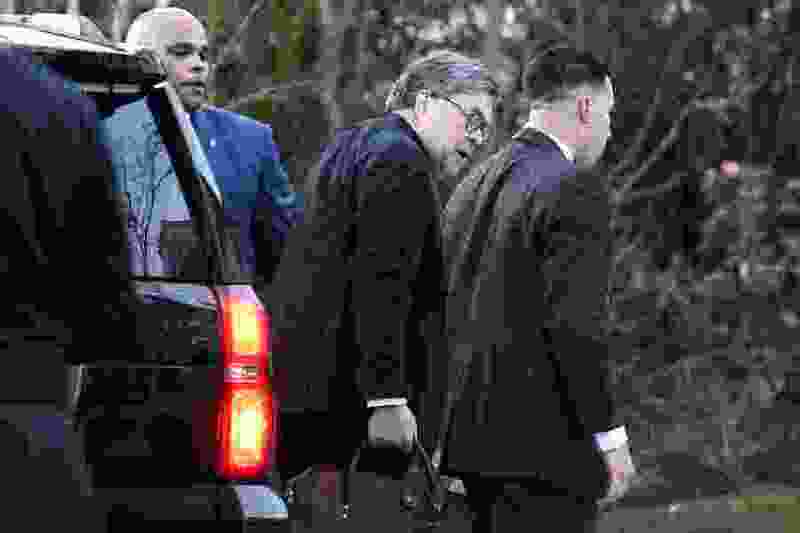 Washington • Attorney General William Barr plans to spend the weekend reviewing special counsel Robert Mueller’s report on his investigation into possible obstruction of justice by President Donald Trump and Russia’s interference in the 2016 election, a senior Justice Department official said Saturday, indicating it would be at least another day until the probe’s findings would be shared with Congress. While the White House, Congress and the country awaited word of the findings, Barr and Deputy Attorney General Rod Rosenstein huddled at the Justice Department, reading and assessing Mueller’s work alongside key advisers. "They're working basically hand in hand," said the official, who like others spoke on the condition of anonymity to share general insights about the attorney general's process. The official said that very few people know the report's contents. The attorney general announced Friday that Mueller’s work had come to an end, and Barr spent that afternoon and early evening in his fifth-floor office reading the special counsel’s final report, which one Justice Department official described as a “comprehensive” document. Barr told lawmakers in a letter that he "may be in a position to advise you of the Special Counsel's principal conclusions" as early as this weekend. A Justice Department spokeswoman said those conclusions would be made public but declined to otherwise describe what was in the report. A senior Justice Department official said the special counsel has not recommended any further indictments - a revelation that buoyed Trump's supporters, even as additional Trump-related investigations continue in other parts of the Justice Department, in Congress and in New York. David Laufman, a former Justice Department official involved in the early stages of the Russia probe, said it was important that the lack of further charges "not be seen as a failure or an invalidation of his investigation." "What matters is that prosecutors and agents faithfully carried out their jobs to uncover the relevant facts and applied law and policy to those facts," he said. "Of particular importance now is the comprehensiveness of the special counsel's evidentiary narrative in the report and how he explains his reasons for declining additional charges." On Saturday, House Democrats held what was billed as an "emergency conference call" to talk about the report. House Speaker Nancy Pelosi, D-Calif., told the roughly 120 lawmakers on the call that "right now, we are in the mode [of] wanting to know the truth, wanting the facts," according to a partial transcript of her remarks. Pelosi said on the call that she would oppose any effort by the Justice Department to restrict the flow of information to a small, classified briefing - arguing that it was important that any briefing on Mueller's investigation be unclassified so that lawmakers can talk about it publicly. The Democratic chairmen of six House committees also spoke on the 35-minute phone call, pledging to seek the full report's public release, and insisting that the underlying investigative material Mueller's team gathered be shared with Congress. Democrats believe that Mueller's work will bolster their efforts to further probe the Trump administration, his presidential campaign, his finances and his business operations. People who took part in Saturday's call said a key message from Democratic leaders was that the end of the Mueller investigation does not end the multiple congressional inquiries into the Trump administration. Rep. Jamie Raskin, D-Md., said in an interview that House Democrats' "number one objective" is to ensure that Barr releases "the entire Mueller report and all of the underlying evidence that it is built on." "Obviously the congressional scope of inquiry is far broader than that of a special counsel," he said. "We've got a broader interest than just nailing particular individuals for crimes committed." "We will be in a position as soon as we get the report and underlying evidence to make the judgment about where we need to go in terms of a number of different live investigations," he said. Trump's supporters, meanwhile, took news of the report's filing as an optimistic indication that he was on the cusp of being vindicated after nearly two years under Mueller's microscope. The president spent Saturday at his Florida resort, accompanied by White House lawyers and senior aides. Rudy Giuliani, one of the president's lawyers, said he has been counseling patience while everyone waits to learn what Mueller found. "My message is: We've all waited this long, let's just await the reading of what's disclosed and then we can have proper final reactions. There's too much assuming going on, on the other side, and we shouldn't fall into that trap," Giuliani said. "The best news is that the release means the case is over. But you can't say more, or know more, until you read it. I'm confident, as I've been from the start, that the president did nothing wrong and that will sustain him. For everything he's done, there's a clear explanation he can make to the public." A person involved in discussions among Trump's legal team, who spoke on the condition of anonymity, said they have prepared a "counter-report" - a series of documents addressing various topics that emerged during the course of Mueller's investigation. Some of the memos deal with what one Trump ally called the "innuendo of obstruction," which they see as an area where Mueller could make unfavorable judgments about the president's conduct. This includes Trump's interactions with James Comey, whom the president fired as FBI director in May 2017, setting off alarms in the Justice Department and in Congress, where lawmakers feared Trump was determined to end the Russia probe before it was completed. Trump's team is ready to challenge Comey's credibility and counter any such conclusions with timelines, said the ally, who also spoke on the condition of anonymity. Trump's lawyers are also looking beyond Mueller, the person said, and preparing to use some of the same arguments and documents to counter any attacks by House Democrats. In his letter to lawmakers Friday, Barr said he would consult with Rosenstein and Mueller, who remains special counsel even though his investigation is complete, "to determine what other information from the report can be released to Congress and the public consistent with the law, including the Special Counsel regulations, and the Department's long-standing practices and policies."